Bring a piece of Ocean Life into your home with this Natural seashell Lamp. 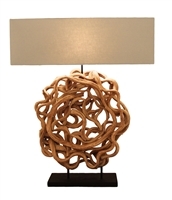 The light and dark contrast makes this lamp a stand out piece in any room. On/Off foot switch. UL LISTED. body is made of cast iron wrapped in Abaca rope, with three shades made of fiber glass, decorated with abaca and class beads, hold three bulbs E7 style 25 watts recommend each. Eye catching and unique don't even begin to describe this all natural Vine lamp. made from natures materials with a natural Jute linen shade, perfect for brightening any room and quite a conversation piece.